"Beautiful pianos of excellent quality. My work and my pianos are fully guaranteed." 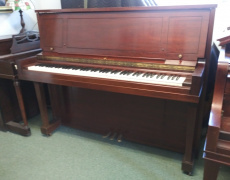 These are just the pianos we've posted online! 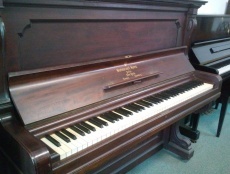 Call or email Rick for inquiries about all of the pianos for sale! 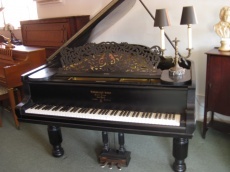 Steinway Grand Model A 6"21/2" #89920 circa 1898 in very good working order. Includes adjustable artist bench. Beautiful complete original cabinet. Enjoy as is, or restore. 1990s gloss black Young Chang (Korean) Professional Studio. Excellent condition. Price new $4800/ Our price $1800. Includes matching bench. Fully serviced, tuned, and warrantied. 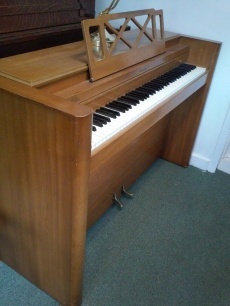 One-owner 1960s Baldwin Acrosonic Spinet. Beautiful mid-century modern walnut cabinet. Matching bench. 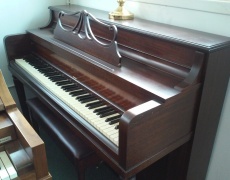 Best small piano in market for tone & quality. Serviced, tuned, and warrantied. SOLD! Cable Console with bench. Solid 1950s tall console. Great condition! Serviced, tuned, and warrantied. $995. 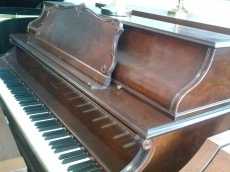 1890s mahogany Classic Steinway upright with original ivory keys. Powerful & rich Steinway sound. Serviced, regulated, and tuned. $2595. Baldwin Acrosonic Studio. Gorgeous book matched walnut veneer cabinet and bench. Finest Baldwin made. Fabulous condition. Serviced, tuned, and warrantied. $2495. 1950s mid-century modern Mini Piano built by Hardman Peck. Matching bench included. Compact but with full 88-note keyboard. Perfect for small spaces and unique. Serviced, tuned, and warrantied. $795. 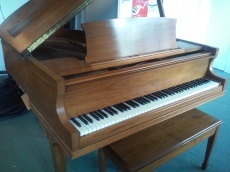 1968 Sohmer Baby Grand Model 50. The best sound and highest quality small grand ever on the market. Beautiful matching walnut cabinet and bench. One owner, original paperwork. Meticulously maintained. Serviced, tuned, and warrantied. $4995. Steinway ca 1968. 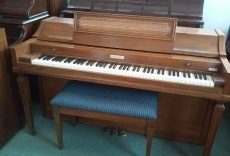 Model 45 professional upright in Honduras mahogany (with matching bench). 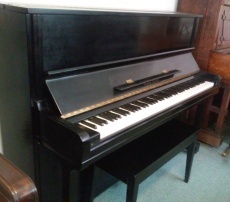 One of best verticals manufactured by Steinway. One in-home owner. Tip-top shape. Finest upright musician's piano. Serviced, tuned, and warrantied. $4495.